This is a Martha Stewart recipe. I love her recipes and the minute I saw this one I knew it would be no exception. I love cookies and cream, so to combine it with a cheesecake sounded like a great idea. This recipe is easy because you are making mini cheesecakes. My 9 year old daughter and I worked on these one Saturday afternoon and we had lots of fun making them. It was an easy, yet really good recipe for her to help me with. We worked on them together and then took them to a church dinner and they were a hit. I did not bring any home and that is always a sign of a good recipe. The one thing about this recipe is that it makes a lot. This worked great for me because I was taking it somewhere, but if you are just making these for you to eat at home, I would half the recipe. The original recipe also said it made 30, I got 42 of them, which is more than my family would eat. This recipe came from the Martha Stewart Cupcakes cookbook, but it is not exactly a cupcake. Heat oven to 275 degrees. Line muffin tins with paper liners. Place one whole cookie in the bottom of each liner. Beat cream cheese until smooth. Scraping down sides as needed. Gradually add sugar and beat until well combined. Beat in vanilla. Slowly add eggs a bit at time, mixing well. Beat in sour cream and salt. Then stir in crushed cookies. Divide between muffin cups filling almost to the top. Bake for 22 minutes. Mine took closer to 28 minutes, so just watch them. It may vary in your oven. Cool and then refrigerate for at least 4 hours. Remover liners and serve. I saw those in the cupcake book! How fun! Thanks for joining in the fun at Cupcake Tuesday! Those sound yummy! I just love Marthas recipes. Thanks for sharing. 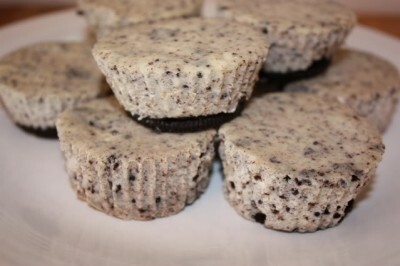 My family loves anything with cookies and cream so I know they’ll LOVE these! Cookies and Cream is my favorite ice cream. That in a cheesecake. yum!!! Those sound absolutely delicious! I’ve been using my cupcake/muffin pans for all sorts of non-cupcake recipes, too, and you’re right, there’s just something about that size that is just so perfect. What a fun recipe for something a little different! Happy TMTT. Thats great that it makes so many, looks great! Paula Deen made something like this once with a mini Reeses PB Cup in the middle- it was too rich for me so I just mix in some mini chocolate chips. I love this idea for a variation. Definitely going to give it a try! I just love cheesecakes! These look too yummy! I made these and they are a great hit with my family!I myself could finish two in one seating.I love your recipes keep ’em coming! Have you tried these with gluten free cookies? Just wondering if they hold up the same or come out all mushy.